Do you have a pulled hamstring? This injury, also known as a hamstring strain, is very common in sports, especially in sprinters and running athletes. Unfortunately, hamstring injuries have the potential to become chronic if not treated correctly. Perhaps one of the most feared injuries in sports (next to an ACL tear), it is also one of the most preventable. Too many athletes suffer from chronic hamstring problems, cutting their seasons short, and signficantly reducing their athletic potential. If you have a pulled hamstring, read on to find out more about your injury, and the best way to solve your hamstring problems. The hamstring is primarily a knee flexor. When the muscle shortens, it bends the knee. It can also help to extend the hip, but this is not its primary job. During athletic activities, the hamstrings primary job is to help decelerate the leg at the end of your gait cycle, in order to help with toe placement. In order to do this, the hamstrings must contract eccentrically. Eccentric contractions occur when the muscle is contracting but is actually lenghthening. This is sometimes referred to as a "negative effect" in weight lifting. Eccentric contractions place a lot of tension on the muscles, and often lead to injury if the muscle is not well conditioned. 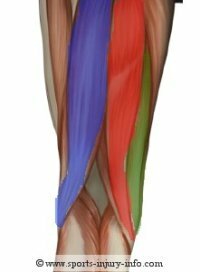 What Causes a Pulled Hamstring? Weakness can be a contributing factor to hamstring injuries in two different ways. The first, although not common, is actual weakness of the hamstrings when compared to the quads. Some athletes may be unbalanced, with the quads dominating the lower extremity and the hamstrings weak in comparison. This can occur if you are performing a lot of squats, step ups, leg extensions, etc. and not much hamstring specific exercises. More commonly, weakness comes in the type of hamstring contraction. Remember, the hamstrings primarily act eccentrically during athletic activities. To improve eccentric contraction strength, you need to perform eccentric type strengthening activities. Unfortunately, most hamstring strength programs do not focus on this type of activity, so you end up with a weaker eccentric contraction. Poor flexibility can also be a factor in hamstring injuries. But it isn't always just the hamstrings. In fact, tight hip flexors often contribute more to hamstring injury than poor hamstring flexibility. Let me explain. The hamstrings and hip flexors both originate off of the pelvis, on the posterior and anterior sides, respectively. As one of the muscle groups becomes tight, they can tilt the pelvis either anteriorly or posteriorly. With tight hip flexors, the pelvis tilts anteriorly, and actually places a stretch on the hamstrings. 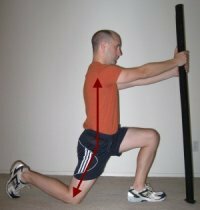 This stretch, combined with the eccentric contractions during activities are a primary cause for a pulled hamstring. Core stability can play a role in a pulled hamstring as well. The core (lower abdominals, lumbar spine, and hip muscles) are responsible for controlling movement in the pelvis. Remember, if the pelvis rotates anteriorly, the hamstrings are placed on stretch. Anterior pelvic tilt is extremely common with core weakness, and so, a weak core will contribute to hamstring injury. Neuromuscular control also plays a role in hamstring injury. 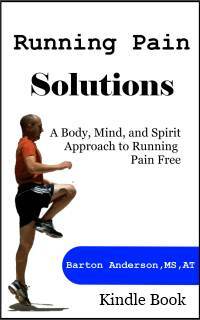 Proprioception and muscle firing patterns help are responsible for efficient functioning of the body. If all of the muscles are not doing their jobs and firing at the right time in the right sequence, the whole system is thrown off. Acute treatment should focus on rest, ice, and compression. This treatment will help control inflammation and pain. Gentle stretching can also help. After the first several days, heat may help to loosen the muscles and allow for decreased pain. You should also see your doctor or healthcare provider if you have pain that lasts for more than 2-3 days. Once you have treated the initial injury, rehabilitation can start. The focus should be on elminating the above mentioned causes. Eccentric weakness, poor flexibility (especially in the hip flexors), core strength, and neuromuscular control. Strenghening activities should include eccentric hamstring exercises - such as dead lifts or Good Mornings. These exercises strengthen the hamstrings in a functional way, and replicate the same stresses placed on them during athletic activities. Core stability should also be a major focus. Exercises that force the core to stabilize while the body is moving are the best. This will also improve neuromuscular control. Flexibility exercises should be focused on the hip flexors. The kneeling hip flexor stretch is a great way to improve hip flexor mobility. The active hamstring stretch will also work to improve your hamstring flexibility in a functional manner. Prevention is the name of the game when it comes to sports injuries. And a pulled hamstring is very preventable. By addressing the above cause factors, you can truly eliminate the potential for hamstring injury with a focused work out program. Include exercises that work on eccentric strength, core stability, and neuromuscular control. Make these activities part of your regular workout, along with a dynamic warm up and flexibility program. 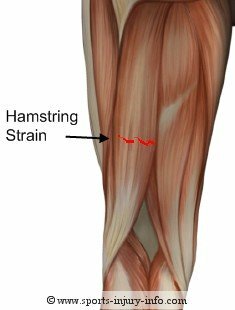 Hamstring injuries have a tendency to become chronic. This is because the rehabilitation often fails to address the underlying causes of the injury. In order to completely recover from a hamstring injury, you must address the mobility, flexibility, balance, and strength issues that led to your injury. Otherwise, you are doomed to suffer a recurrence. 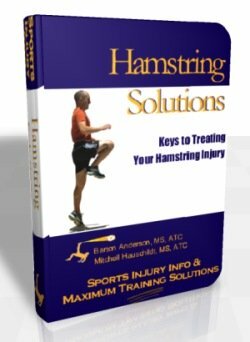 Hamstring Solutions is a complete program designed to put your body back into balance, and to address all of the underlying mobility, flexibility, balance and strength deficits. This program not only will treat your hamstring injury and reduce your risks for re-injury, it will also enhance your sports performance. A balanced body is a stronger body, and Hamstring Solutions can give you both! To prevent chronic hamstring problems, make sure to incorporate all of these treatment activities into your rehab program. Remember, if you don't address the underlying causes of your injury, you are much more likely to suffer re-injury. Even if you are pain free and feel ready to return to sports, if you still have flexibility problems, weak eccentric muscle function, and poor firing patterns, you are at risk.